There are many data tables out there, that are unfortunately not transcribed into usable form, but are stuck as images that cannot be searched. A thermodynamical blog, CarnotCycle, has provided some of these here. Having no entertainments of any lasting value, I’ve decided to transcribe that one into a common format, Microsoft Excel (2007+ file format). They are here: CarnotCycle-Thermodata. Although he claims they are in SI, they aren’t. SI does not use the calorie as a unit of energy, instead using the joule. Similarly with degree centigrade and kelvin. I have added a tab to convert the semi-SI to full SI. Digit significance has been maintained while doing this. I do not know what book he got them out of, so I have to request you cite them as coming from his blog, for now. If you want to credit me with the transcription, that is fine. Use your preferred/recommended/required citation style to do this. Some values were given in parenthesis. In Excel, parentheses are used to indicate a negative number in accounting. I changed this format to gray background with center-aligned numbers. One value was given with a question mark. This is marked with a red background. One value is suspiciously positive, I have marked this with a yellow background. Where needed, scientific notation is use to maintain the correct number of significant digits. This entry was posted in daily life, engineering, physics, publishing, standards, thermodynamics, typesetting, volunteerism and tagged CarnotCycle, chemistry, physical chemistry, thermodata, transcription, useful information on August 13, 2017 by FlowCoef. The horizontal line is just there for symmetry. All modern and proper word processor programs (are they even called that now?) have a way to easily insert special characters like this. All modern file formats support the × character and no web browser will fail to display them correctly. Please use this!! It is the correct symbol and gives your work a much more professionally done appearance. If the math is algebraic, it may prevent a confusion between the variable x and a multiplication! This entry was posted in publishing, typesetting and tagged symbols on January 18, 2015 by FlowCoef. I type out plenty of technical information. 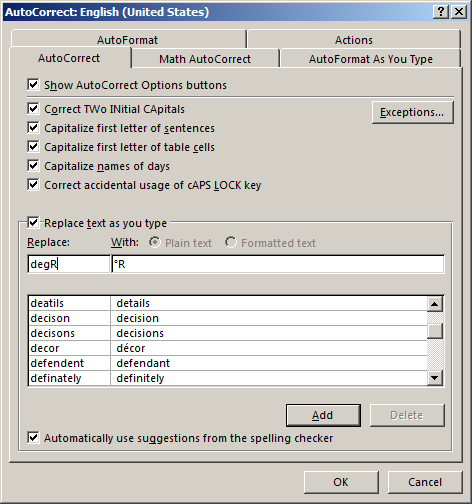 For equations I use Word’s equation editor that has replaced the old equation editor since Office 2007. I recently had to edit some old-style equations and realized how much of an improvement the new one was in usability and utility. When I’m not using equations but typing information in sentences, such as “The temperature is 1155 °R” or “The mass flux is reported in g/s·m2“. In these, I have to use special (non-keyboard) characters such as the degree sign or middle dot. Looking these up by charmap (I’m on Windows) or the Insert > Symbol menu is slow. Open a blank document in Microsoft Word. Using charmap or Insert > Symbol, type the degree sign. Beware of “º”, the “masculine ordinal indicator”! It’s wrong! Follow it with “C”, “R” or “F”. OK out of the dialog box and Options window. To test this out, start a new document and type “degR” and hit space. You should end up with “°R”! Note that kelvins are do not use the degree sign, so “°K” is incorrect. This entry was posted in engineering, Microsoft Word, publishing, typesetting and tagged engineering, Microsoft Word, PC on January 7, 2015 by FlowCoef.